Wednesday April 12th 1899 I did a little washing, baked bread and in the afternoon ironed what I had washed. I worked on my rug a little in the evening. Boys very busy. 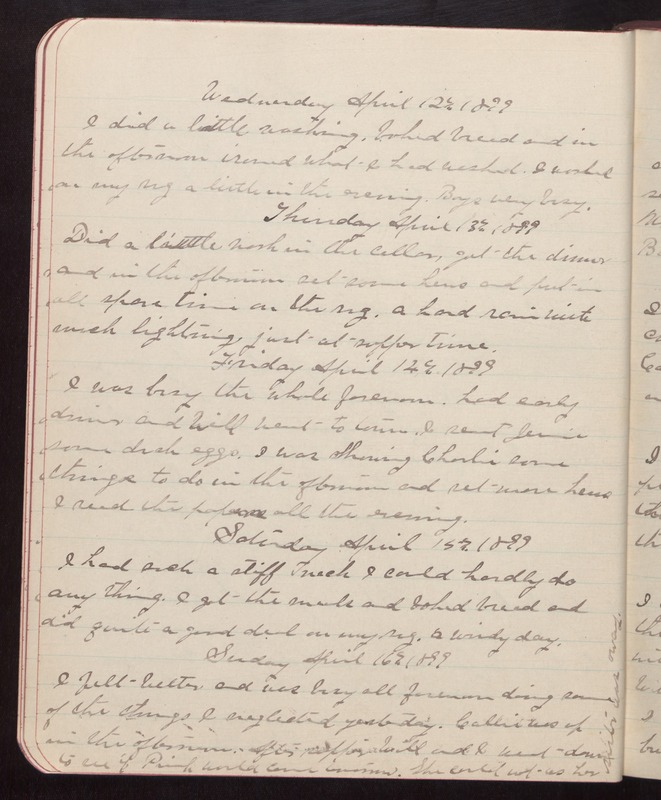 Thursday April 13th 1899 Did a little work in the cellar, got the dinner and in the afternoon set some hens and put in all spare time on the rug. a hard rain with much lightning just at supper time. Friday April 14th 1899 I was busy the whole forenoon. had early dinner and Will went to town. I sent Jamie some duck eggs. I was Showing Charlie some things to do in the afternoon and set more hens I read the papers all the evening. Saturday April 15th 1899 I had such a stiff neck I could hardly do anything. I got the meals and baked bread and did quite a good deal on my rug. A windy day. Sunday April 16th 1899 I felt better and was busy all forenoon doing some of the things I neglected yesterday. Callie was up in the afternoon. After supper Will and I went down to see if [Pink?] would come tomorrow. She could not as her sister was away.